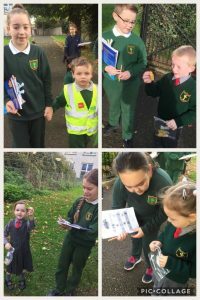 5th class were on Buddy Duty again this week as we escorted the Junior Infants around the school grounds on a “Signs of Autumn” Nature Hunt. We helped the little ones complete their checklist as they collected their Autumn leaves, conkers and berries for their nature table. (We didn’t catch any squirrels.) 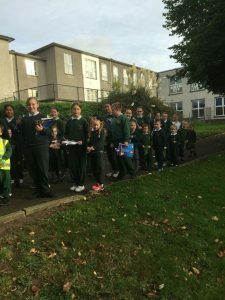 The junior infants were much more chatty this time with their senior buddy – a sign that they’re settling in well and getting used to their “big” friends! Well done 5th class on being good mentors!